It's been raining a lot this spring. Personally I hate the rain, but it does set a mood and has its merits. And in the big city, one perk is quiet. There are places and times where there is little opportunity for quietude or a place to sit. Like a well located park bench on a sunny day. 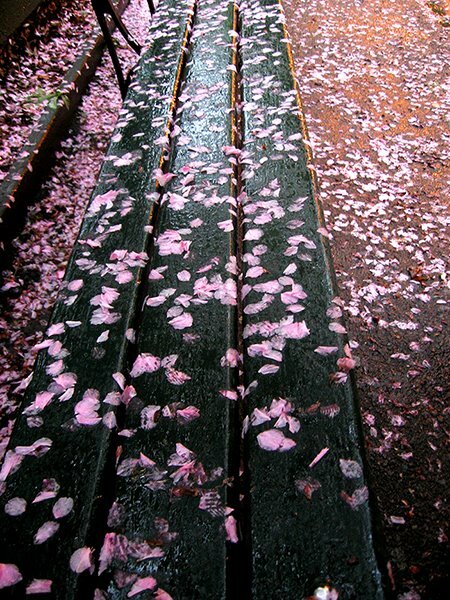 So to see a bench like this, with flower petals undisturbed is unusual - this is something one can see perhaps in the early morning, off hours, in remote out of the way places or in inclement weather - like the rain. I am a social person. I love people and that is one of the great things about living in New York City - eight million people from every corner of the globe. Today I will meet a woman from French Polynesia to do a photo tour - I look forward to meeting her. But there are times when I yearn for a moment when I can be alone. When there are no people.